One of the most common estate planning tools with many benefits is the living trust. Creating a living trust is a very useful way to avoid the time and expense of probate. If you are considering including a living trust as part of your estate plan, you should know more about the living trust benefits you can expect. Our Overland Park living trust attorneys will explain those to you here. A “living trust” is a particular type of trust that becomes effective while you are still living, as opposed to being created by your will after your death. As with other types of trusts, the assets you transfer to the trust will ultimately be managed by a trustee and later distributed to your beneficiaries pursuant to the instructions you include in your trust document. What makes a living trust different is the fact that you can name yourself as trustee during your lifetime, and then identify a successor trustee to take over after your death. A last will and testament and a living trust both provide a way to distribute your estate after your death, however they do not operate in the same manner. Your will only takes effect after your death, distributing your remaining property to your designated heirs and beneficiaries. However, a living trust is effective during your lifetime, holding your assets in a trust account for your benefit while you are living. Then, when you pass away, the living trust will control how your remaining assets are distributed. Essentially, as the name suggests, a living trust functions while you are living but your will does not. If you still have questions, ask our Overland Park living trust attorneys. Probably the most commonly known benefit of a living trust is the opportunity to avoid probate. If you have a will, your estate must be probated in order for your property to be distributed to your beneficiaries. If you do not have a will, your estate must still be probated so the court can determine which heirs will receive your property. However, one of the best living trust benefits is the ability to avoid the probate process, which means your heirs can receive their inheritances quicker with less cost to your estate. Living trusts, like trusts in general, are less likely to be disputed in court. A will contest can cost your estate a significant amount of court and legal fees. But with a living trust, the potential for a legal dispute is sharply reduced. Living trusts are legally binding agreements between you and your trustee that provide specific instructions which are difficult to dispute. Also, living trusts are valid in all fifty states regardless of where the trust was originally executed. Overland Park living trust attorneys recognize that being able to retain some semblance of privacy is important to most people. That means a living trust is often the right choice for many people. The terms of a will become public record because a will must go through public probate proceedings. 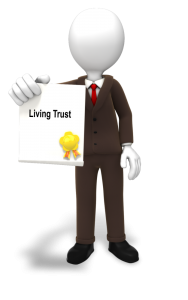 Living trusts, on the other hand, are not made public so the nature of your assets and how you want them distributed remains private. Because living trusts are revocable trusts, you can modify their terms at any time while you are still living. In fact, you should review your trust agreement periodically in order to make necessary changes as your life circumstances are certain to change over time. Changes in your family circumstances such as the birth of a new child, marriage, divorce, usually signal the need for revisions. Your ability to amend or revoke your living trust is unlimited while you are alive. Download our free estate planning worksheet today! If you have questions regarding living trusts or any other estate planning matters, please contact the experienced attorneys at Gaughan & Connealy for a consultation. You can contact us either online or by calling us at (913) 262-2000. We are here to help!